Jewel is a vigorous grower, producing dependable, large crops and has good winter tolerance. It is resistant to Leaf Spot. 'Jewel' is a fantastically vigorous grower, often ranked as one of the best June-bearing strawberry varieties, producing very large, plump, delectably sweet berries. It is a late-season berry with exceptional harvests, even in coastal gardens; its fruits are excellent eaten fresh, canned or frozen. 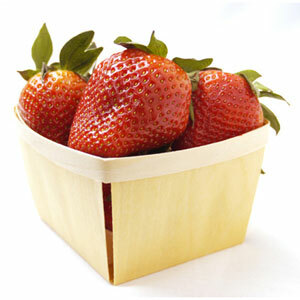 All our 'Jewel' Strawberry Plants are organically grown and shipped in fine quality growing medium. They are guaranteed to arrive alive and ready to plant. "Jewel Strawberry (Live Plant) 2.5-Inch Pot"
Comment: Ordered this Strawberry plant and it arrived in great condition and is still very healthy. Love this website and the items they offer! Comment: This is the best variety I have ever grown. They were vigorous from the beginning. I even cheated the first year and let some plants produce fruit so I could taste it. They were delicious. They have overwintered beautifully in this unusually cold winter. The runners have set strong new plants. I am seriously considering replacing a bed of a weaker variety with these new plants. Comment: I am so looking forward to getting these plants (at just the right time to plant) and growing my own strawberry garden.